Christmas Gift Ideas For Mum. Who can believe its November already!? Christmas is most definitely creeping up on me this year and my mind has turned to Christmas presents and what to buy for everyone this year. I always struggle with what to get my mum as I feel like I often get her the same thing each year and my husband says the same. 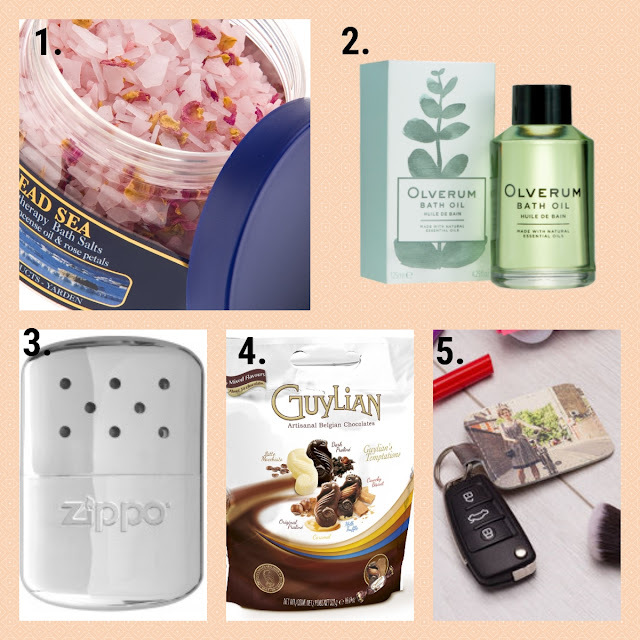 He never knows what to get me from the kids and so I wanted to put this little gift guide together with some fab gift idea's for mums of all ages. Hopefully it will help you out to find some fun, interesting and beautiful new gift idea's for the mum in your life! With the beautiful scent of Frankincense oil and rose petals mixed with aromatherapy oils, these bath salts come in two tempting varieties. Spicy frankincense that both calms breathing and unwinds tense muscles. Or fragrant jasmine which adds tone and moisture to worn out bodies. Just a few handfuls scattered in the bath will transform ordinary water into an elixir of relaxation. All you need to do is, turn on the taps and lie back. What friend wouldn’t be grateful for a present like that! Price - £6.85 per 500ml tub. Price - £29.00 per 125ml (enough for 25 baths). 3 - Zippo hand warmer - £23.95 available from zippo.co.uk. When you’re outdoors, you want to stay warm but my hands always seem to be the first thing to feel frozen! Whatever you might be doing you don’t want distractions like cold hands. Zippo’s has this covered with their new Zippo hand warmers that are simply to use and keep your hands warm! Simply fill the cup, light the burner and done! Up to 12 hours of heat for your hands and fingers and the new smaller size fits snuggly in your pocket for flameless comfort and warmth. 4 - Guylian's chocolates temptations pouch £9.50 per pouch. Who doesn't love chocolate!? Well now mums can enjoy the ultimate chocolate indulgence with the big Guylian’s Temptations Pouch Pack. The Pouch Pack contains 54 individually wrapped Sea Horse chocolates in Original Praliné, Milk Truffle, Caramel, Latte Macchiato, Dark Praliné or Crunchy Biscuit flavours. Unwrap, indulge and let the wave of tastes enthral your senses. Where to buy - Guylian.com or Tesco. 5 - Bags of Love personalised Keyring. These personalised leather keyring takes presentation of photos in new direction and make a lovely keepsake gift. Uploading your very own photo to these keyrings is simple helping you make custom printed leather photo keyrings, with pictures both sides to make a bespoke keyring or fob that will last for years. Are you organised with your Christmas shopping yet or do you like to wait until December to start? Such a cute selection of gifts. I always end up asking my mum what she wants as she has everything! This is a lovely selection of gifts and is really handy as I've only just started Xmas shopping! Mums are always the hardest to shop for! Some good ideas here though. I’m due to start my xmas shopping next week- wish me luck haha!